10 Secrets to an Effective Performance Review: Examples and tips on writing employee reviews, performance evaluation, sample performance review and employee evaluation forms. Download your FREE copy of 10 Secrets to an Effective Performance Review: Examples and tips on writing employee reviews, performance evaluation, sample performance review and employee evaluation forms! Use Business Management Daily's practical advice for writing employee reviews and conducting performance evaluations. Don’t forget to reference our sample performance review and employee evaluation forms for your own staff assessments. If you’re relying solely on your memory when writing employee reviews, you’re making employee performance evaluation far more difficult than necessary. That’s why it’s best to institute a simple recording system to document employee performance before writing employee reviews. The most useful, easy-to-implement way is to create and maintain a log for each employee. Performance logs don't need to be complicated or sophisticated. They can simply be paper files in a folder or computer files. 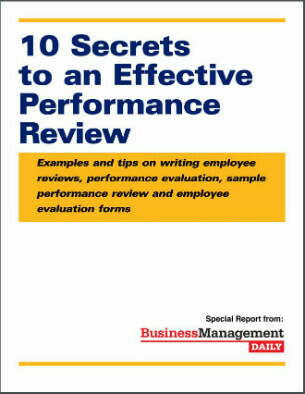 Find Business Management Daily’s six steps for recording performance before writing employee reviews in 10 Secrets to an Effective Performance Review: Examples and tips on writing employee reviews, performance evaluation, sample performance review and employee evaluation forms. Sitting down to conduct an employee performance evaluation with a staff member is the part of the appraisal process most managers dread. But the session doesn’t have to be tense or uncomfortable. Match traits to the job. When you discuss an employee performance evaluation, beware of using common phrases that can unintentionally communicate the wrong message, or come across as too negative or personal. Your goal in writing performance reviews is to help shape employees’ performance without becoming sidetracked by anger, emotion or fear of conflict. To do so, Business Management Daily has identified some surefire phrases to avoid when explaining an employee performance evaluation. It sounds so easy: Expect high performance and you won’t be disappointed. Expect so-so performance and that’s what you’ll get. But reality is more difficult. To help your employees maximize their productivity, use these three practices when writing performance reviews to help define what you mean by “high performance” and lay out how you expect your people to attain it. Involve them in setting goals. Never assume you’ve got buy-in. Rather than blindly dropping project goals, individual goals or the organization’s goals onto workers, approach them with the thought, “What do you think you can achieve?” Then negotiate your expectations. Keep the goals realistic. Any goal—whether it’s at work, at home or on the athletic field—needs to be difficult, desirable and doable. Setting goals too high will only deflate the worker; setting them too low will erase the challenge of work, which will turn off the person in its own way. Avoid micromanaging. You may want to lay out every detail of how employees should achieve those goals, but resist the temptation. If you spend most of your managing time telling employees how to do their work, rather than trusting them to reach the clear goals you’ve set, you’re treading into micromanagement waters. Job reviews shouldn’t be paper-moving programs that return zero value. Joan Rennekamp, HR pro at the Denver law firm of Rothgerber, Johnson & Lyons, identifies five symptoms that warn of trouble in a supervisor’s appraisal process. Discover the five warning signs that your employee performance evaluation has gotten off track in 10 Secrets to an Effective Performance Review: Examples and tips on writing employee reviews, performance evaluation, sample performance review and employee evaluation forms. Say you manage a 55-year-old employee whose productivity drops over the year. Instead of citing specific, measurable examples of this decline in his employee performance evaluation, you note, “Kevin doesn’t seem to have the energy level anymore to truly succeed in this department.” Still, you rate Kevin’s work as “average,” the same as last year. Evaluation of attitude, not performance. Vague statements that attack an employee’s demeanor could be interpreted as some kind of illegal age, race, gender or disability discrimination. Instead, supervisors should use concrete, job-based examples to illustrate any criticism. Never use the word “attitude” when writing employee reviews. Employment lawyers and courts often see that as a code word for discrimination. Evaluation inflation. Supervisors too often rate mediocre employees as competent; competent employees as above average; and above-average employees as superior. The problem comes when an employee is fired for poor performance, yet his history of reviews tells a different story. The employee then has a supposed proof that the real reason for the firing was something else, maybe something illegal. To determine if you inflate reviews, ask yourself the following questions: Who are my worst performers? Knowing what I know about them, would I hire them again? Do their reviews reflect their true performance? Writing employee reviews is always a daunting task for supervisors, for many legitimate reasons: Judging others’ work often appears exceptionally perception-driven (vs. fact-driven), and providing honest feedback is potentially confrontational. Plus, if you overinflate grades, you create a record that may not withstand legal scrutiny if you later want to terminate or discipline the employee. In reality, it doesn’t need to be that way. One simple way to reinvent the employee performance evaluation is to shift the responsibility for the initial assessment back to your employees, says Paul Falcone, an HR executive and best-selling author. If you ask workers to grade themselves, you’ll find (more than likely) that they’re harder on themselves than you’d ever be! And this, more than any other exercise throughout the year, may place you and your supervisors in the roles of career mentors and coaches rather than unilateral decision-makers and disciplinarians. Find out what three core questions you should include on employee evaluation forms when seeking self-evaluation from your staff in 10 Secrets to an Effective Performance Review: Examples and tips on writing employee reviews, performance evaluation, sample performance review and employee evaluation forms. Don’t forget to reference our sample performance review while you’re writing employee reviews for your staff.